Our sister company RFID Secure Ltd has become a finalist in the 2015 Security Excellence Awards. The Classic Badgeholder with BloxProx was judged by an independent panel of industry experts to be one of the best products in 2015 for the Access Control Product of the Year (Including Biometrics) Category. The winner of this category will be announced at prestigious Awards Ceremony on Wednesday 25 November 2015 at the London Hilton, Park Lane. We have added Purses and Wallets to the product list in time for Christmas. There are eight new styles ranging from mini wallets in nylon and leather, together with a Bifold 10 slot RFID Wallet, Vertical Two Tone 9 Slot Wallet and a Slim Bi-Fold 7 Slot With ID Wallet for yor pocket or purse. In addition we have introduced our take on the Classic Chain Wallet. For the traveller we have a RFID Blocking Passport Wallet and our nylon Passport Traveller which has a colour matched nylon mini wallet available. Stop the Card Clash has introduced four new Secure Sleeve design packs. Each pack contains five different sleeves based on the packs theme. Contactless payment cards are now accepted for travel on the Tube, tram, DLR, London Overground and most National Rail services in London. Bus journeys can only be paid for by oyster cards or contactless cards! When you use a contactless payment card, you'll be charged pay as you go fares at the same rates as adults using the Oyster card. You could also benefit from daily and Monday to Sunday capping. 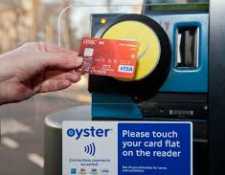 However TfL warn that if you touch your purse or wallet containing more than one unprotected contactless card (including an Oyster card) on a reader you could be affected by card clash and your fare could be charged to a card you didn't intend to pay with or you could be charged two maximum fares if the card reader reads one card when you touch in at the start of your journey and a different card at the end when you touch out. For peace of mind, make your contactless payment cards invisible in our secure sleeves, where they cannot be used by mistake.